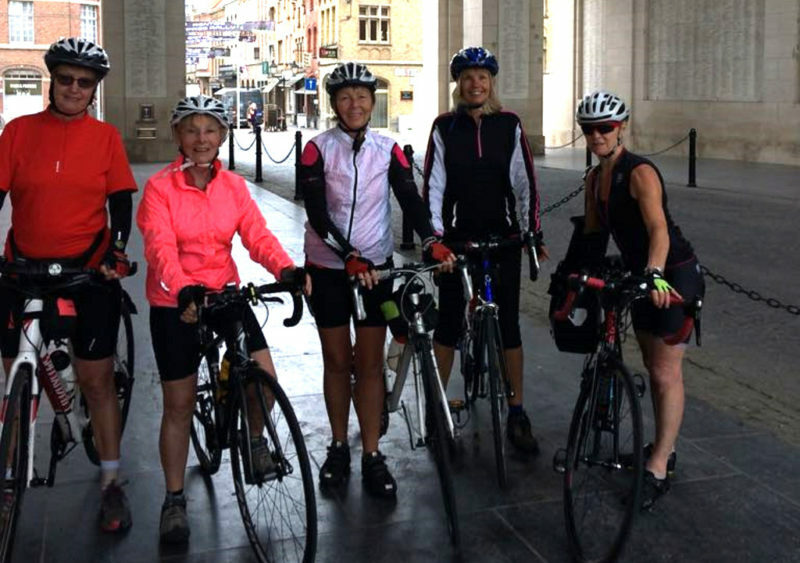 Six intrepid ladies (including 4 Anerley members) set off last week for a mini cycle tour across France and into Belgium. After a lovely meal in Dover and a good night’s sleep in the Premier Inn, we caught the early ferry to Calais (and showing our not so skilful knot skills when tying the bikes up on board!). 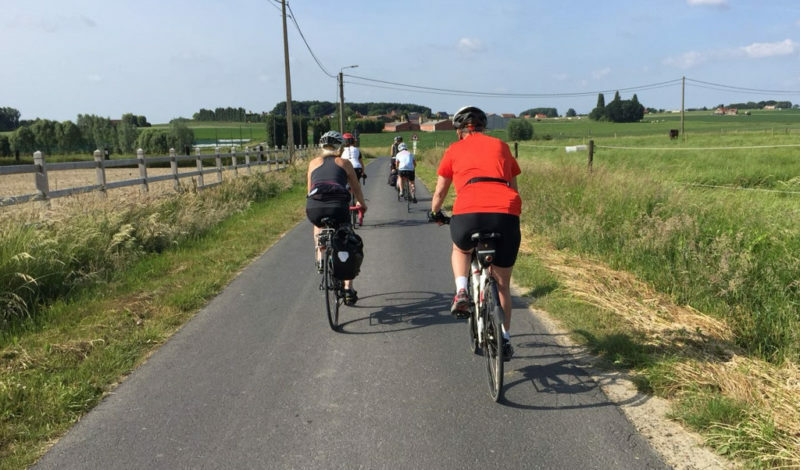 We set off East towards the Belgium boarder and against our first head wind. 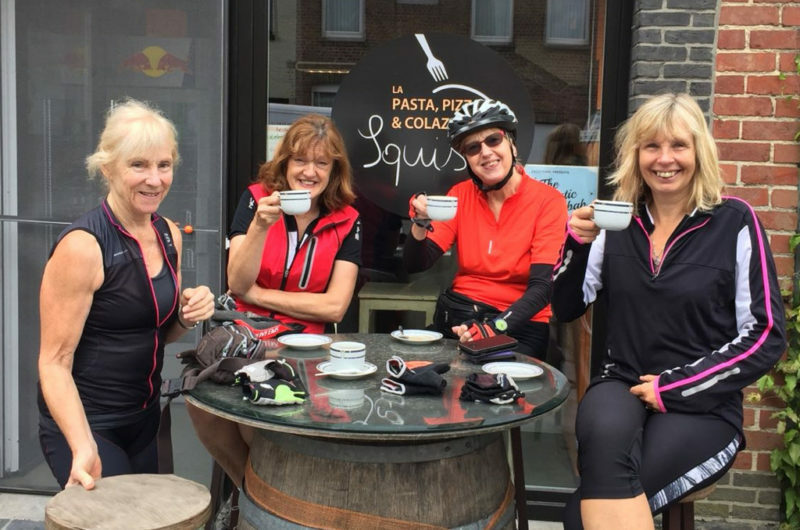 The first 20 miles were fairly uneventful and we were soon tucking into cakes from a French bakery and trying to make a local café understand that a cup of tea needed more than half an inch of water on the tea bag and that, yes, we really did mean ‘cold’ milk with it. We continued to Wormhout where, because most of the shops and cafes were closed for the afternoon, we had an unfortunate lunch of pate and chips! Not the best of cycling meals. Eventually, after 57m, we arrived in Ypres and found our Airbnb. Denise had booked an amazing place with plenty of room for us to lounge around on the sofas before getting ready for dinner. 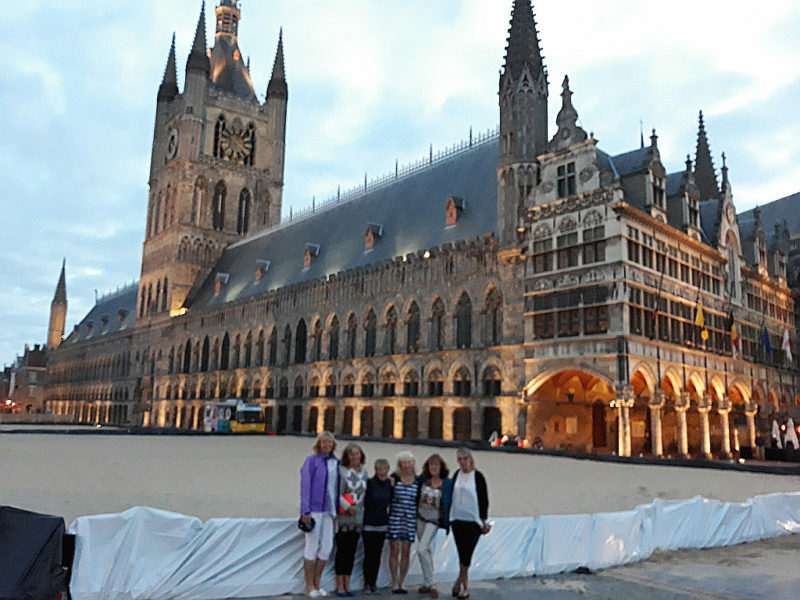 We had a lovely evening meal in the Ypres square. 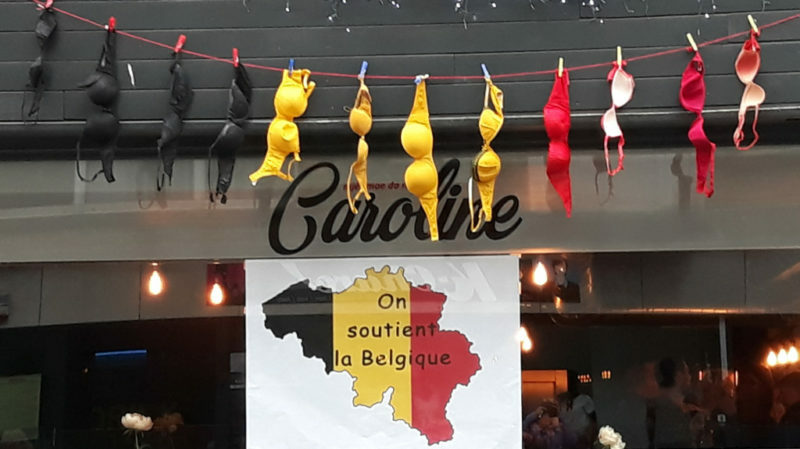 Everywhere the Belgium colours were showing to support Belgium in the football world cup. 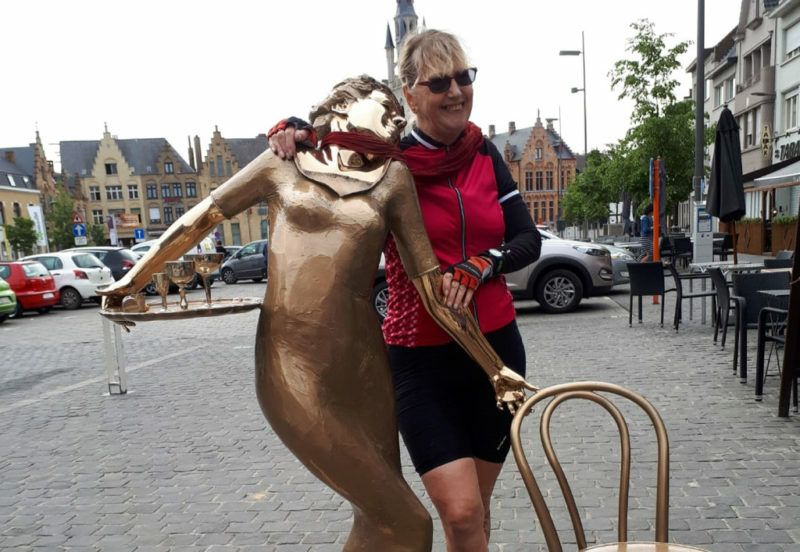 The following day we did a 57m circular route via Torhout. The route was very flat and followed cycle networks along small roads with very little traffic. We were surrounded by fields of wheat, corn and just about every root vegetable you can think of. We stopped at a lovely café for morning coffee where, unfortunately, Jenny turned right instead of left when looking for the toilet and came across the guard dog. It gave her a nasty bite as well as some scratches and bruises but she was incredibly brave and so we continued. 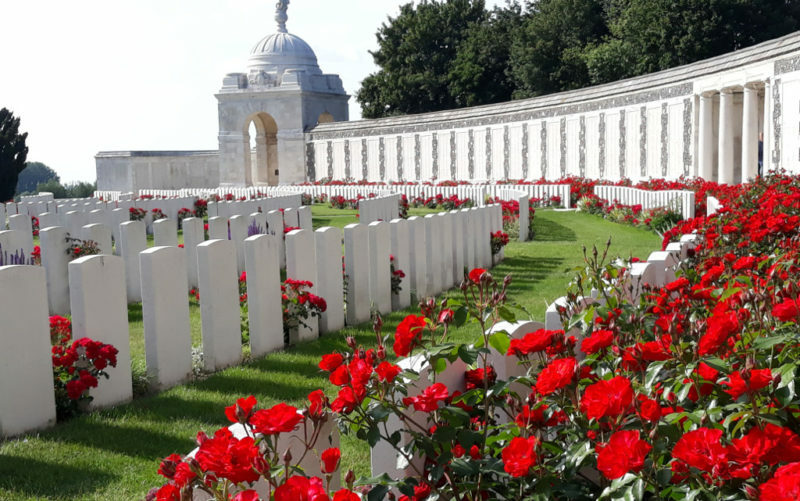 After a lovely lunch in Torhout we went to visit the town’s Castle which turned out to be expensive and we didn’t really have time to do it justice – so instead headed for the Tyne Cot Commonwealth War Grave Cemetery near Passendale. This was an incredibly emotional place – beautifully kept, with the names and ages of the soldiers read out. Back in Ypres we attended the ‘Last Post’ ceremony at the Menin Gate. This ceremony takes place at 8pm every night and has done so since July 1928 – the only time when it was interrupted was during the German occupation in World War 2 when the daily ceremony was conducted at Brookwood Military Cemetery in Surrey. The ceremony was resumed at the Menin Gate on the same evening that the Polish forces liberated Ypres in 1945, despite heavy fighting still taking place in other parts of the town. 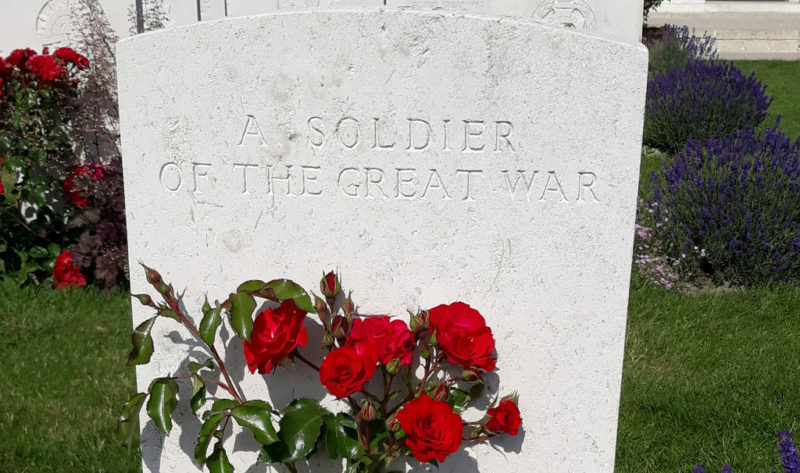 It’s a ceremony giving the citizens of Ypres the chance to express their gratitude towards those who had given their lives for Belgium’s freedom. Hearing the buglers was very moving. 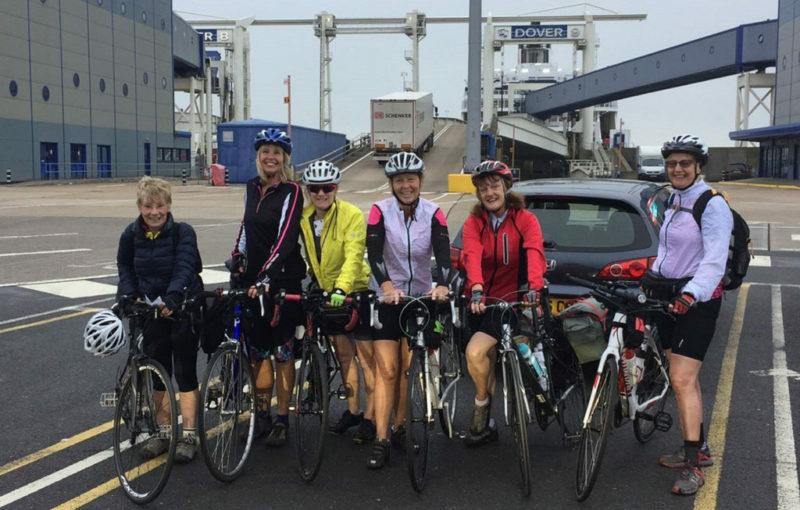 The final day’s cycle back to Calais started with four out of the six ladies leaving their bikes without wanting to. Sue’s pannier caught in her wheel causing her to fall off, Jenny left her bike when it hit a kerb causing Denise to gently fly over her handlebars behind her and Gerry’s clips were suddenly too tight as she tried to take her foot out on a tight corner. No one was seriously hurt so we continued into yet another head wind. 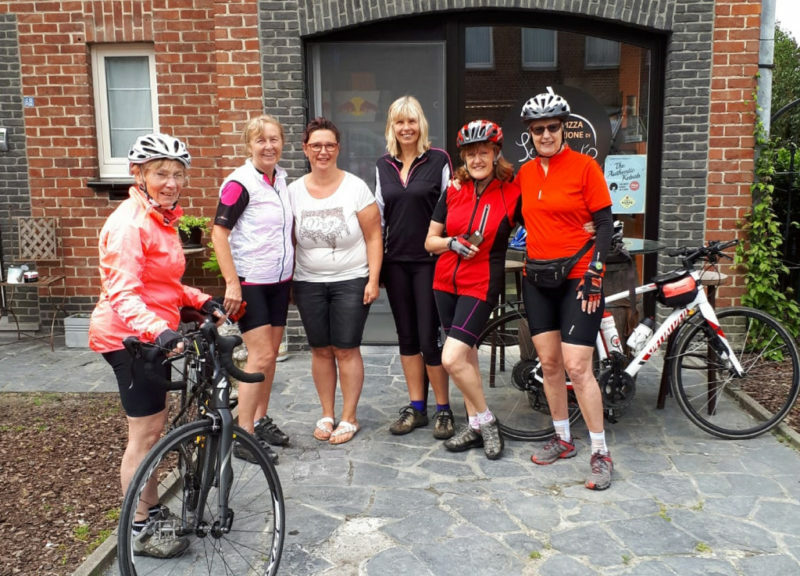 We had decided to get some miles done before having breakfast and arrived at Poperinge famished, so enjoyed some delicious pastries. These were served with a dollop of Advocaat – a traditional alcoholic beverage made from eggs, sugar and brandy and which went down a treat at 10am!! Poperinge is a lovely town very near the Belgium/French boarder. From 2015 Poperinge served as a garrison town to the British troops where they waited ready to advance on Ypres – the front line. A statue of ‘Ginger’ (Elaine Cossey) stood in the square. She was a red haired girl working at the café (owned by her father) and who had a mesmerising effect on the soldiers. 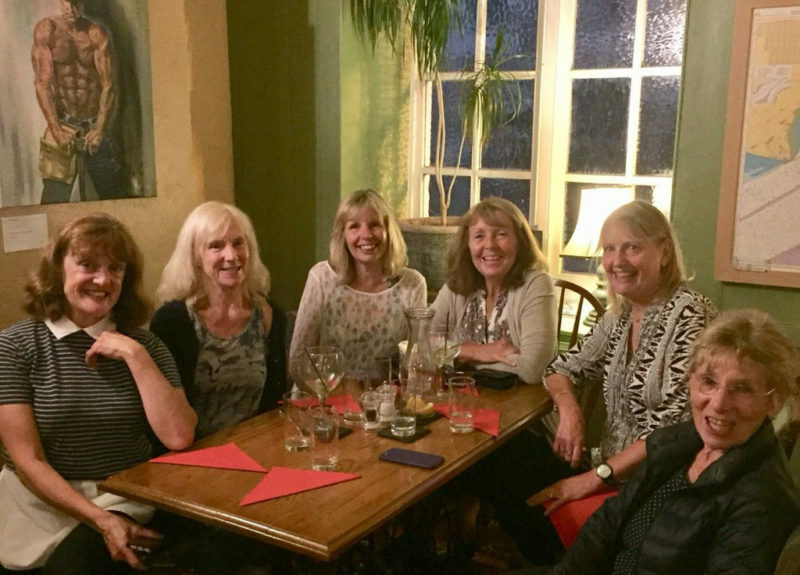 So much so officers of all nationalities came to see her and the café soon became known as ‘Gingers’ rather than its previous French name. After a lunch of French bagettes in Bourbourg, the head wind became more difficult to cycle against in the flat and open countryside and then the rain came! We were quite happy to get on the late afternoon ferry and head home. All in all over 160m and an eventful but fun time was had by all.